Hilton finds unlikely, soothing unity. To think that one of Britain’s leading contemporary artists could have spent his life wearing a tie and working for the proverbial man! Instead, Barry Hilton is riding an ever-growing wave of popularity. His limited edition, one-off paintings sell like hot cakes. Let us give you a little insight into the life story and artistic style of a truly special modern painter! If the path he has walked is anything like the path still ahead, we are all in for a very unique journey. Barry Hilton was born in Manchester in 1941. 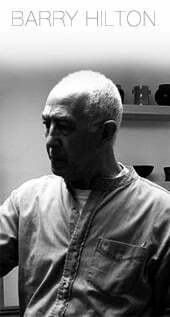 Although he was always compulsively drawn to the brush and easel, he pursued a formal education in ceramics and design. His career path then took him to the chemical industry, in a role which involved a great deal of travel. After a move to Cornwall in the late 1970s, Hilton realised it might be time to put away the frequent flyer card for good. Thanks to a vibrant community of Cornish artists, the idea of pursuing painting as a full-time vocation blossomed in his mind and heart. Hilton enjoyed the company and creative exchange his new residence had to offer, and his artistic vocabulary expanded rapidly. In a perfect marriage of nature and nurture, a talented late-bloomer landscape artist was finally born. Despite some detours along the way, Barry Hilton finally arrived at the place that had seemingly always been set aside for him. Hilton first caught the public’s and the critics’ eye with his seemingly minimalist, intriguing landscapes. The colour contrasts give his works a pulse, a mesmerising dramatic vision of earth and sky that meet at a razor’s edge. Sometimes with almost photographic granularity and clarity, the sprawling vistas gradually reveal more and more to the keen viewer. 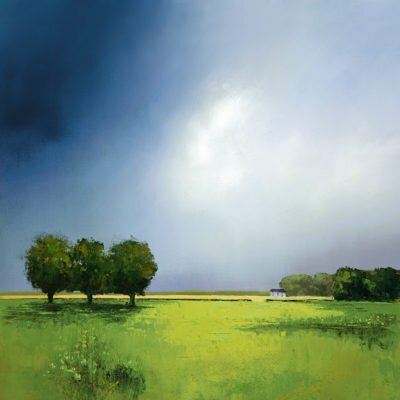 For all the dynamism and juxtaposition Barry Hilton injects into his art, each work of his is an invitation. ‘Come over, stop for a while, and lose yourself into this sight!’ Behind the often-monolithic earth and sky, there are a million brush strokes waiting to be discovered, acknowledged, and understood. Hilton’s paintings are like nature itself: delightfully simplistic at first, intriguingly complex on second thought. In the artist’s own account, it all began with walks among intensely yellow rapeseed fields set against a stormy sky. It is an image that has never left the eye of Hilton’s mind. With admirable talent and palpable passion. He recreates nature’s paragon of contrast and intensity over and over again, to the delight of connoisseurs at home and abroad. After making a splash (pardon the impending pun) with his field paintings, Barry Hilton has also shown a keen interest in maritime subjects. The rougher, nuanced textures of rapeseed or strawberry fields give way to the placid mirror surfaces of ocean shores. Here, too contrast reigns supreme. In typical Barry Hilton fashion, however, it is somewhat unexpected. The agitation that so often describes his fields now moves to the skies. Complex cloud structures and textures roll out along sharply delineated vectors. Rays of light cut cumulous masses like the sharpest knives. The water underneath shows not a hint of this spectacle. As if ocean and sky have magically switched their places. The raw motion we have come to expect of the ocean is gone. Hilton’s waters are all but solid in their tranquility. They do not acknowledge the tumultuous skies above; they are almost of a different world. So are the artist’s limited edition sunsets where the earth once again merely frames the dramatics of the ether. The sun’s last gasps, sometimes gentle and sometimes raging, fall upon wheat fields or quiet moors. How nature has submitted all its beauty to be reimagined in oil and acrylic, courtesy of Hilton’s gifted hand and nimble vision! 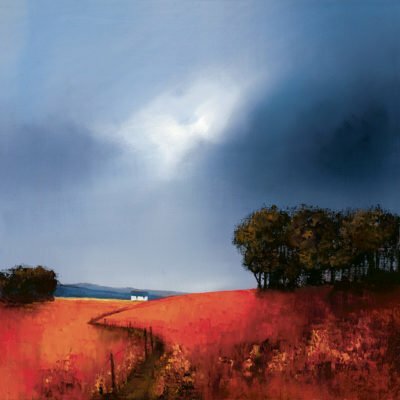 Even though he has a signature style, which has made him highly recognisable and even more highly sought after, Barry Hilton is also very adaptable. As an artist, he constantly evolves, he appropriates new patterns and techniques. He is not ashamed of following trends. Ever since he gave up his corporate job and his boss prophesied he would never make a living, Hilton keeps one keen eye on the bottom line. He knows that what sold ten, 20, or 30 years ago will not have the same impact today. Far from being a sellout or a people pleaser, the proud Northern artist is happy to take on whatever is in vogue today. He then puts his characteristic spin on it. Rather than an act of artistic conformity. It almost feels like a rebellion instead. ‘Okay, I see what is hip today. Yes, of course I can do it – even better than the rest!’ And so, once again, Barry Hilton presents us with a contrast. This time between commerciality and creativity. Sure enough, he masterfully unifies the seemingly clashing pieces once more. No wonder his works are on display all over Britain. Buyers queue up eagerly to own one of his enthralling pieces. Whatever is next for Barry Hilton, we most definitely know he will not bore us. The adventures of extreme artist; Philip Gray!